Sorry for the late update, there’s been some, uh, scheduling issues that delayed this month’s chapter. I’ll try to get the Masked chapter up this week at the usual time, but no promises. I am really dissapointed with this chapter. I was super looking forward to that talk between Megumin and Chris, but it was short as hell. In the novel Megumin gave long and detailed confession on why she fell in love with Kazuma and how serious her feelings are. Here it was just “I love Kazuma” “Ok bye”. FFS. It was the part, that shouldnt have been cut. I think all characters are cute with this art style. I love this mangaka way more, than the mangaka of the main Konosuba series. They made that exchange between Megumin and Chris short as hell, and I hate it. I like this art style very much. Who was that girl in Chris mind? 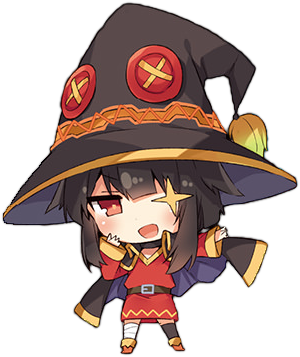 Megumin: What time is it?